Club Plastic, with 13 years of tradition, is one of the eldest and most popular clubs in capital. It's located on corner of Dalmatinska Street and Takovska Street, and represents one of favorite places in Belgrade of urban crews. Club Plastic has very interesting music program, consisting of frequent guest performances of famous domestic and foreign DJs. 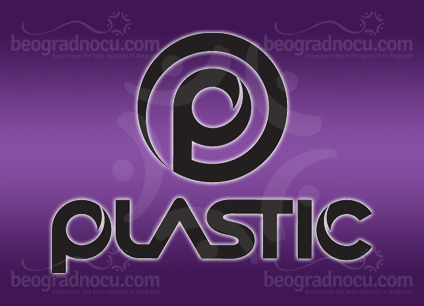 Past few years, club Plastic has became a new model of night life in Belgrade. Western style interior and various theme parties, has made this club very popular among foreigners. With passage club Plastic is connected to club Mint, so you can enter from one club into the other, even though each one has a separate entrance. Even though these two clubs are connected, they are playing different music: in club Plastic you can hear pop, RnB, house and mashup sounds. Mint offers you funk, deep, progressive, acid jazz, as well as many other genres. In both clubs electro music lovers will find something for their taste. In downtown, in part of town known as ''Dvojka'', four nights a week, in this club you can expect parties that can eve lasts until dawn. Working hours of this club are from 11 pm until 6 am. Wedensday is reserved for hip-hop and rnb sounds, with different promotions of brands and clothes. On Thursday evening you can listen to progressive house sound, and this parties will remind you on big festivals, such as Ultra and Tomorrowland. Friday evening is night of culture and fashion, so besides house music, you can expect, fashion shows, movie promotions, new music editions, and everything involved with culture. Saturday is a story for itself, since it's the most crowded and most hottest evening in capital. While Plastic is No 1 mainstream place in town, Mint is a bit different and best underground and electro place in Belgrade. A sort of intimate and sheltered, club Mint is for years known as a club, where you can't enter so easily, because it's very crowded. During a summer season, when city transfers to the river, instead of club Plastic, there is river club Plastic Light, with amazing summer entertainment.